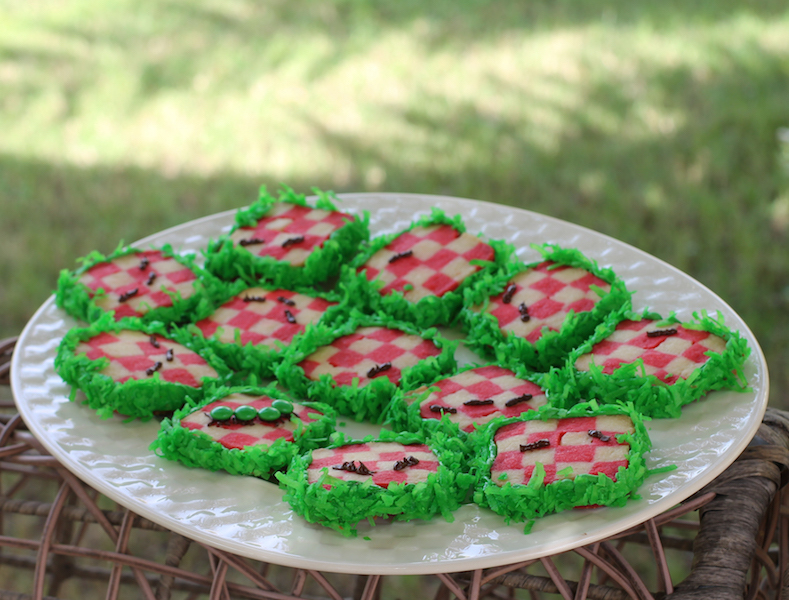 Perfect for a picnic-themed party or for taking on a picnic, these festive vanilla sugar cookies are decorated with royal icing and coconut and are actually quite easy to make, though the process takes time. My step-by-step photos show you how. Back in the years of small children and birthday parties, we lived in places that either didn’t understand children’s birthday cakes as Disney-enthralled children imagine them or there simply weren't bakeries that could produce cakes like we wanted. 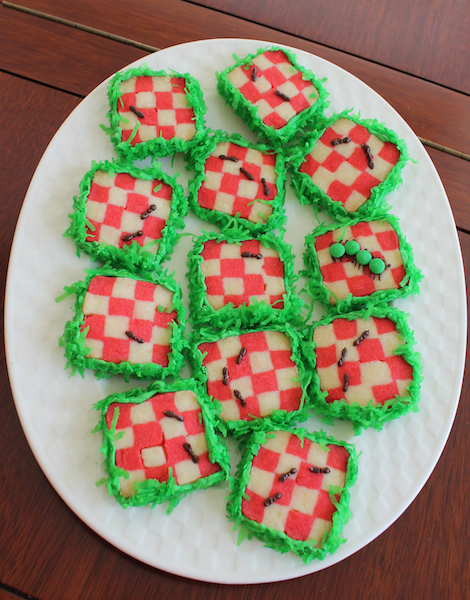 So my girlfriends and I always made the cakes. Esmeralda from the Hunchback of Notre Dame, 101 Dalmatians, The Little Mermaid, a standup Barbie doll in a ball gown, just to name a few. Whatever my girls wanted, they got. 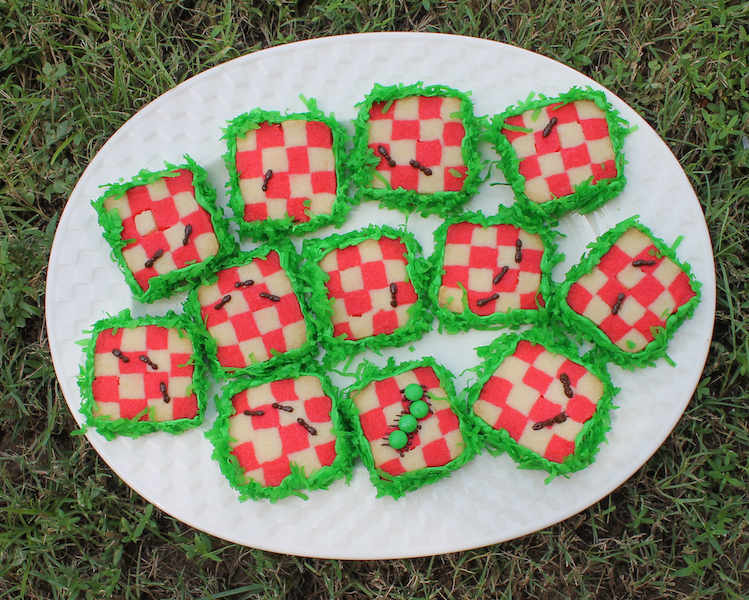 One year our elder daughter wanted a picnic themed party so I baked a rectangular cake and decorated it green, like grass and topped the whole thing with a picnic scene, complete with gingham picnic blanket and tiny picnic fare. 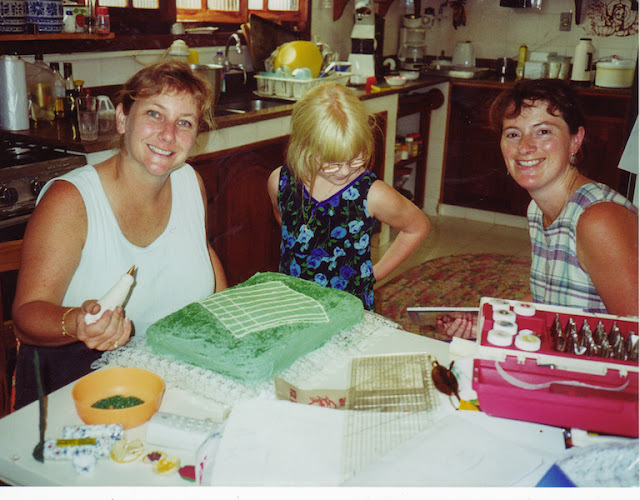 Instead of actually writing this post, I just spent way too much time looking for a photo of that cake and sadly managed to turn up one where we were only starting to decorate. my friend Jacky, wielding the ruler. See my decorating tool box? This was serious business, folks! This was in the days before digital cameras and I must confess that my system of organizing photos lacked, shall we say, a system. Or organization. Can anybody relate? 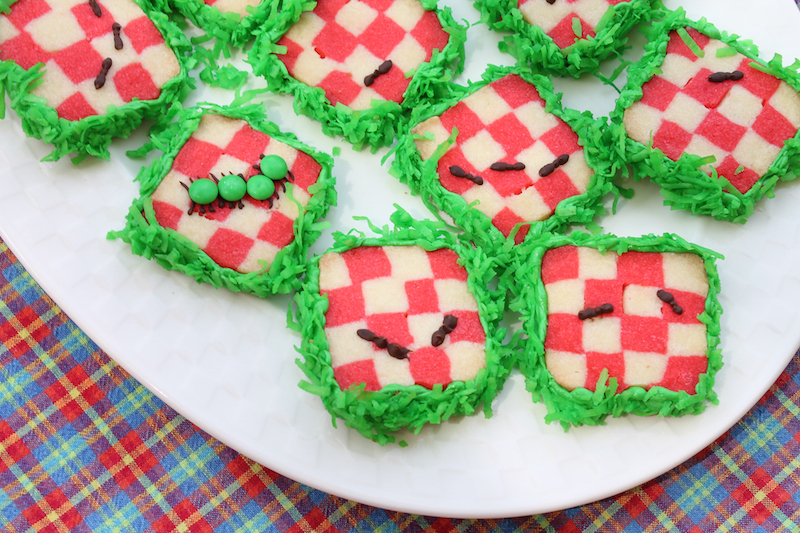 Nonetheless, that cake was the inspiration for these cookies because our theme for this month’s Creative Cookie Exchange is Pack for a Picnic Cookies. Now possibly The Spiced Life doyenne, Laura, our illustrious leader and chooser of themes, meant only cookies you could take on a picnic and in that these would also qualify. But picnic cookies meant a walk down memory lane for me with gingham and grass. And ants. Possibly the random caterpillar. Bugs aside, it felt good to go there. As I mention in the first paragraph, these are not hard to make, but they do take time. Most of it is hands-off chilling in the fridge time though so don’t let that scare you off. Red food coloring gel. Or your preferred color for gingham. N.B. I use Wilton’s no taste red gel. <Amazon affiliate link. 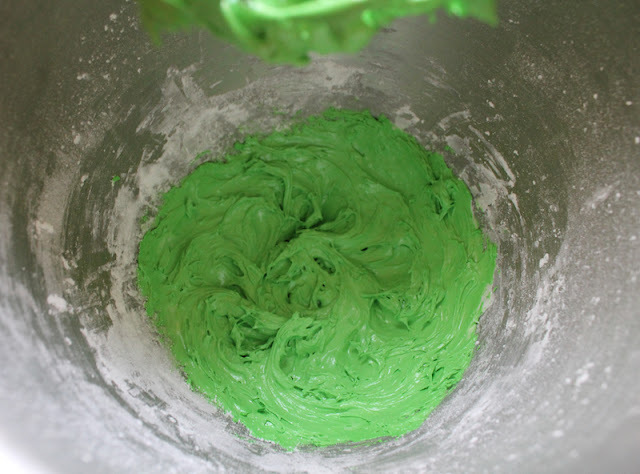 Liquid colorings add too much moisture to the dough so it’s best to avoid them. The amount depends on how dark you’d like your dough. Do keep in mind that the dough will darken as it chills. Green food coloring (I used Wilton’s leaf green gel. <affiliate link) The amount depends on how dark you’d like your grass. 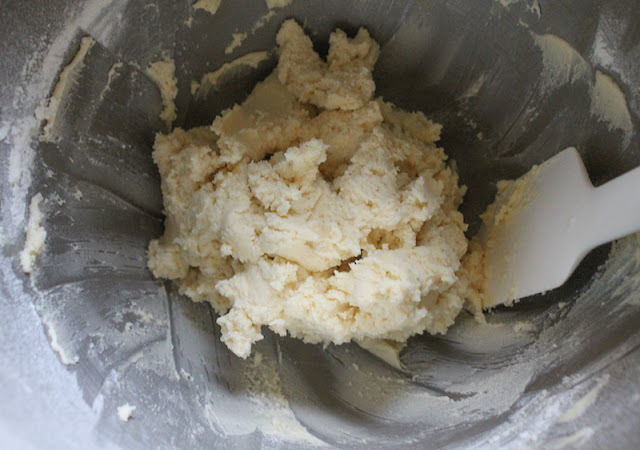 Cream the butter and sugar with your electric mixer until fluffy and pale yellow. Add the vanilla extract and beat again. Sift your flour and salt into the bowl gradually, beating well between additions and scraping down the sides of the bowl with a rubber spatula occasionally. Turn half of the dough out onto a clean work surface and knead a couple of minutes. 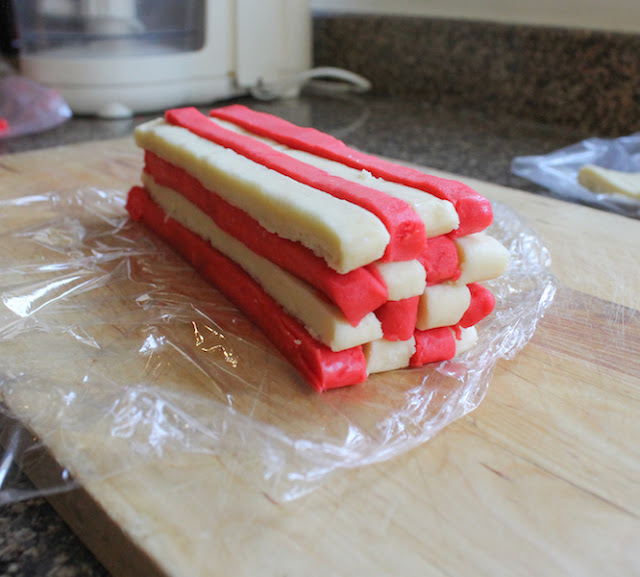 Shape it into a rough rectangle and wrap it in cling film and refrigerate. 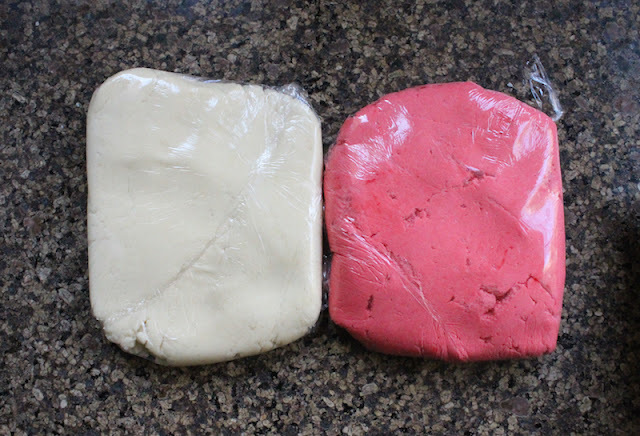 Add red or other food coloring to the other half of the dough still in your mixer. Mix on low until the dough is a nice homogeneous color. 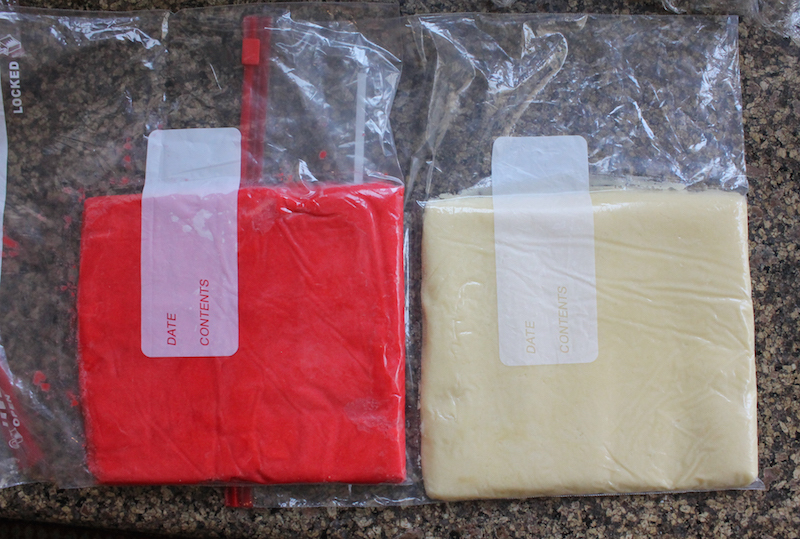 If the color is to your liking, form the dough into a rough rectangle, wrap it in cling film and refrigerate it. The two doughs before the first chill. Once the dough is firm enough to hold its shape well, use a folded plastic bag and a rolling pin to shape it into two more precise rectangles, tucking each into a corner of each bag and folding the sides over to keep the dough in when you roll it flat and even. After the first chill and shaped into straighter rectangles. You can see how much darker that red has gotten. Chill again for at least one hour. 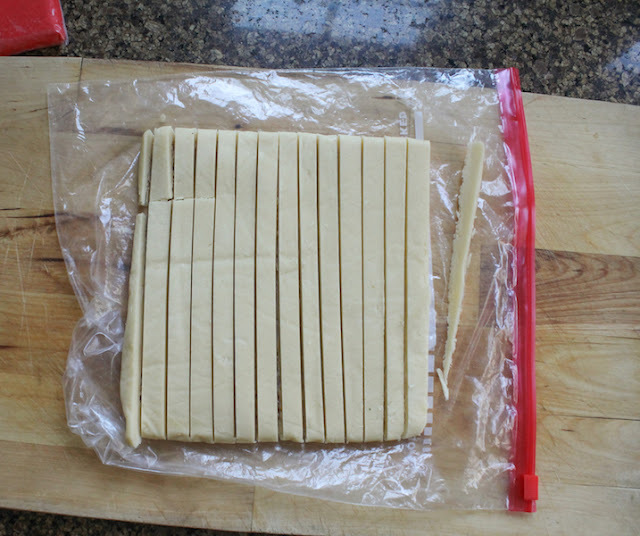 Remove the rectangles of dough from the bags and trim any uneven edges. Cut each into strips as wide as the rectangles are thick. The goal is very long rectangular blocks as wide as they are tall. For you teachers and parents out there, think Cuisenaire rods. On top of a piece of cling film, start assembling your gingham cookies by alternating white blocks with red blocks and building upwards to create a 3x3 block or 4x4 block pattern. Lightly press the blocks together as you stack them. I was able to make one with a 4x4 block pattern and one with a 3x3 block pattern and only had one long block left over. This step is important. See how loosely the pieces are attached in the photo above, despite being pressed into place as each was added? We are going to fix that! Wrap the stacked blocks tightly in cling film then lightly tap them on your work surface so the blocks are pushed uniformly together, creating a square “log” of sorts. Do this on every side and then do the ends as well. Refrigerate for another 30 minutes or until you are ready to bake the cookies. 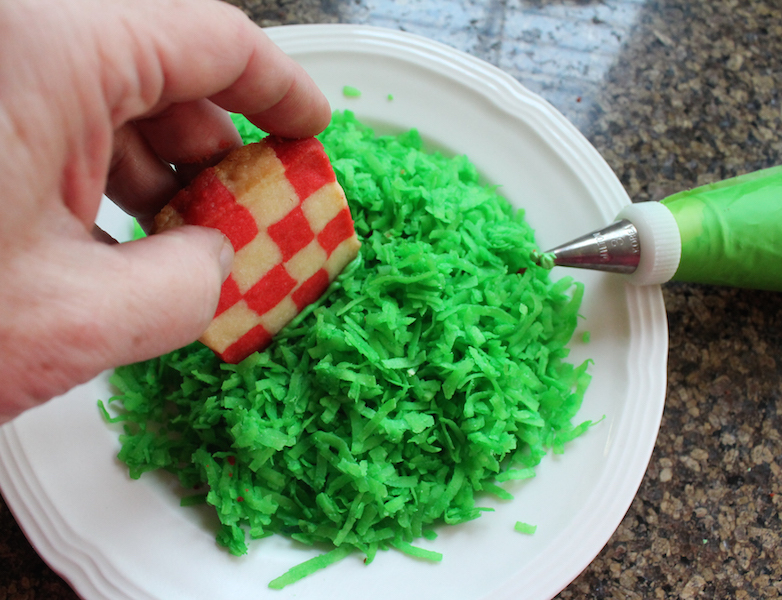 Meanwhile, you can make the royal icing and color the coconut. 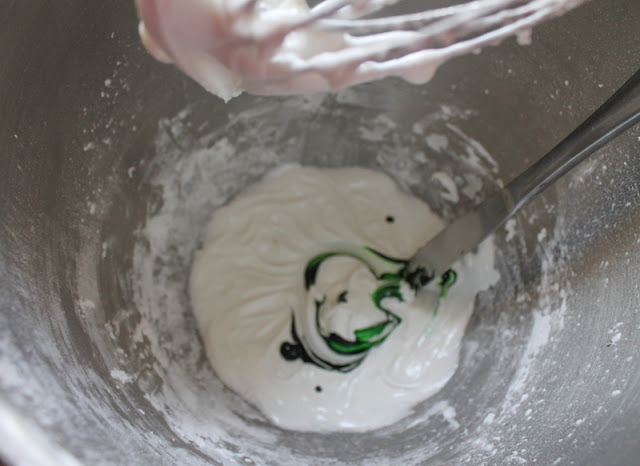 To make the royal icing, use the whisk attachment of your stand mixer to beat the egg white and lemon juice until just a little foamy. Sift in the powdered sugar and salt gradually. Continue mixing until the sugar is completely incorporated. Add some green food coloring at this point, if using, and mix well. 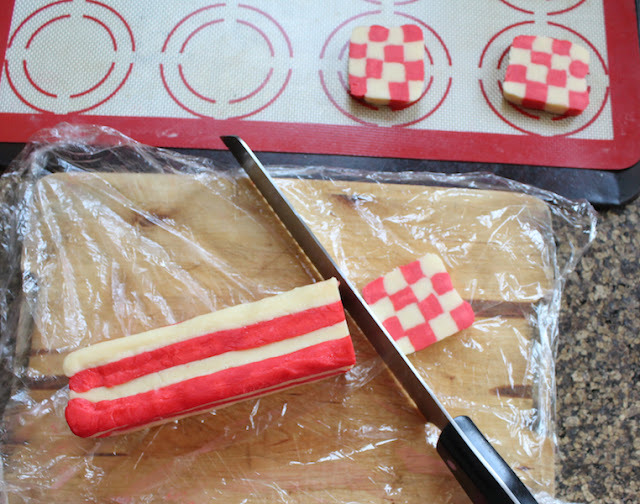 Keep it covered with cling film until ready to use or the royal icing will harden up. To color the coconut, add it to a Ziploc bag along with a good 1/4 or 1/2 teaspoon of gel coloring. Shake and knead the bag until the coloring is more or less uniformly dispersed in the coconut. This will keep in the freezer for ages if you end up not using it all. When you are ready to bake the cookies, preheat your oven to 350°F or 180°C and line a baking sheet with a silicone mat or baking parchment. Unwrap one of your gingham “logs” and cut off the uneven ends. Now cut the logs into slices as wide as each square on the end. 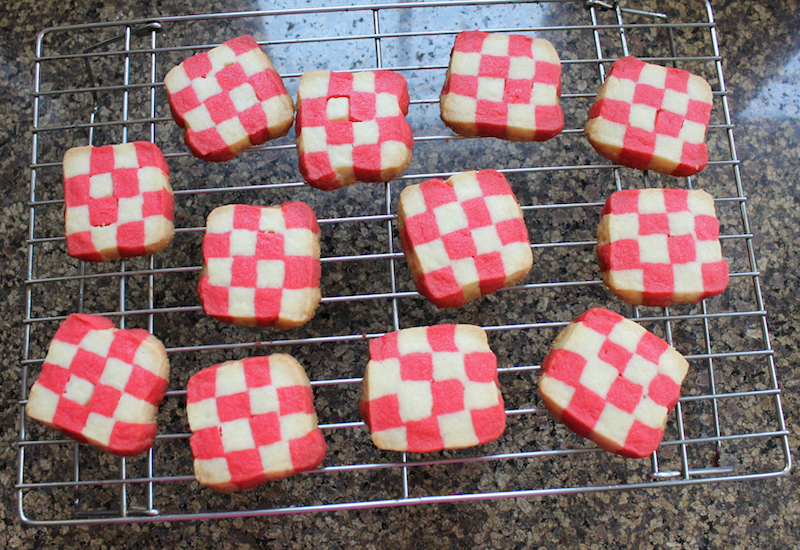 Bake in your preheated oven for about 1-12 minutes or until the edges are just starting to brown. Remove from the oven and cool on a wire rack. Continue until all the cookies are baked or freeze the balance of the dough, rolled tightly in cling film. 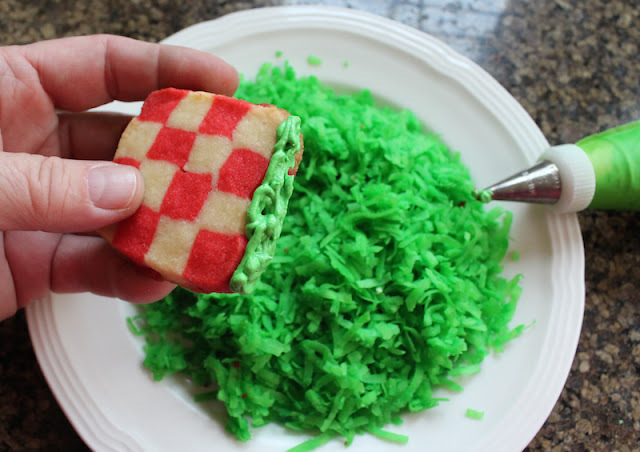 When the cookies are completely cool, fill a small plate with your colored coconut and pipe or spread royal icing on one side of each cookie. 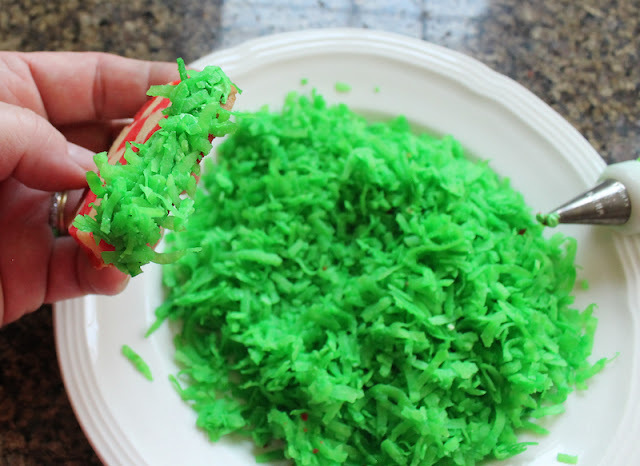 Dip that side in the green coconut immediately and press down just a little so the coconut sticks. And voilà! Now do the other sides. 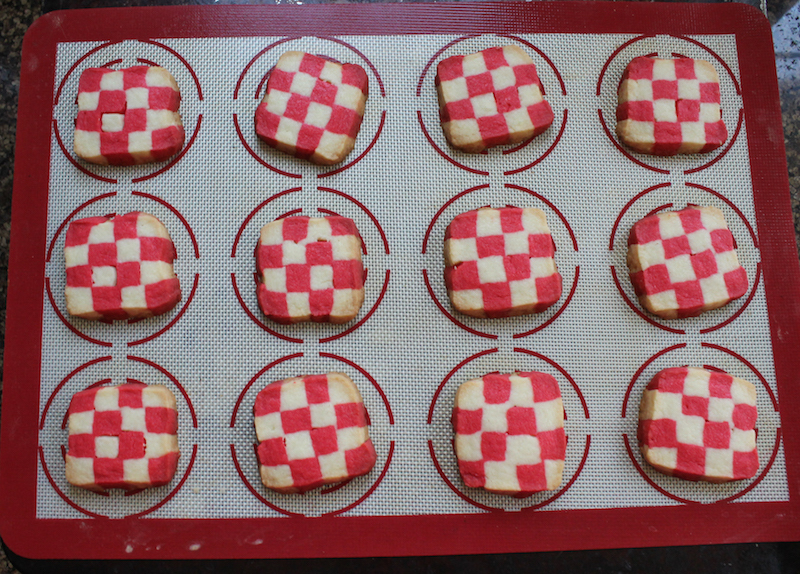 Place back on your cooled silicone mat or baking parchment and leave till the royal icing sets. If you are in a hot climate like I am, you can pop these in the refrigerator to speed it up. To make the ants, microwave some chocolate until it's just melted but not hot. It doesn’t take but a few squares for a few ants so use your judgment. 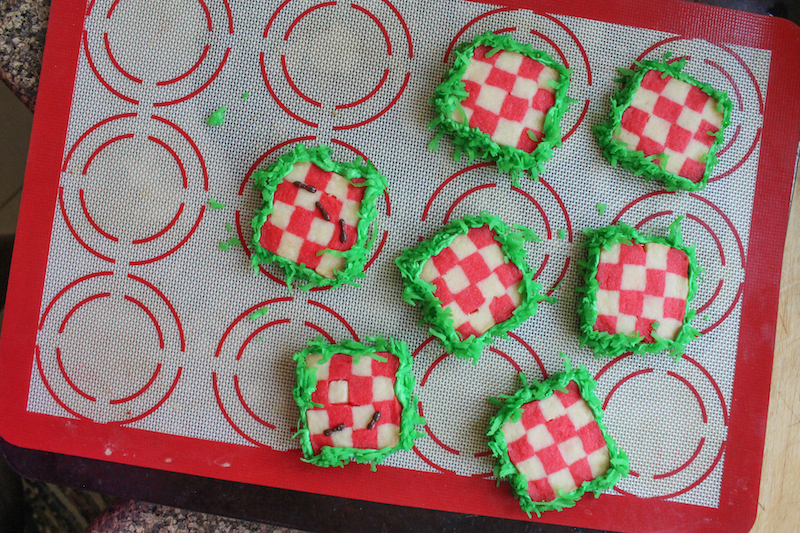 Use a piping bag with a small tip to dot the cookies with ant-like shapes. Use dots of chocolate to hold down mini M&Ms and to make caterpillars with tiny legs. This first batch was from the 4x4 cookies. Sadly, I didn't take any photos of the 3x3. You can also just use us as a great resource for cookie recipes--be sure to check out our Pinterest Board and our monthly posts (you can find all of them at The Spiced Life). You will be able to find them the first Tuesday after the 15th of each month!